Anti-vaccine loons often claim that the only reason for vaccinations is the capitalist system and the ill-gotten profits of vaccination. The incidence of morbidity associated with measles ranged from 909 to 3,510/100,000 persons during the period 1953-1965. From Figure 1 it can be clearly seen that the incidence of morbidity was reduced remarkably after the introduction of mass vaccination and now is maintained at <20/100,000 persons. Note that the Y axis is a log scale, so the precipitous drop in cases from 1965-1967 was from about 2000 to 50 cases per 100,000. In 1965 the population of the Shanghai area was roughly 10 million, so a morbidity of 2000/100,000 persons would be roughly 200,000 cases per year. 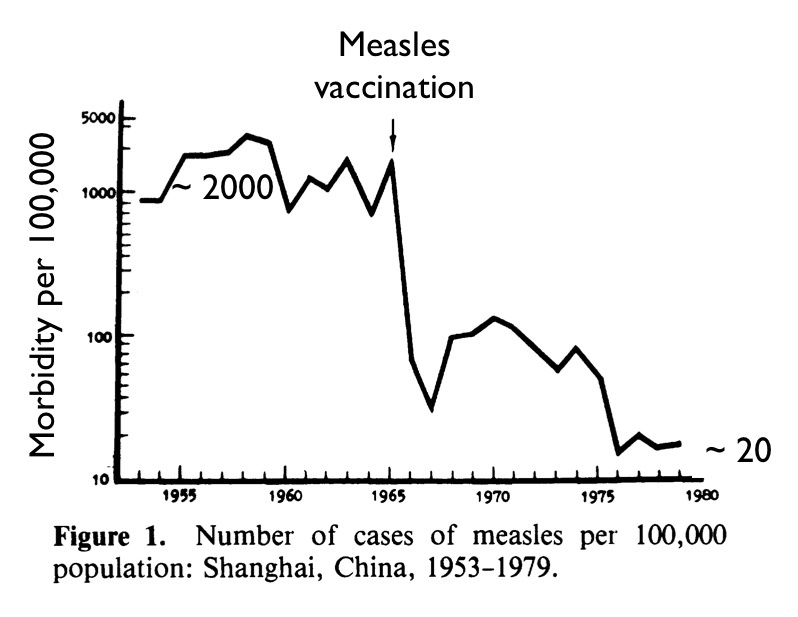 The mortality rate for measles in China (as elsewhere) was around 1-2%,2 so that’s roughly 2000 deaths per year — mainly of infants and children, of course — that the vaccine prevented. Another typical loon claim is that vaccines don’t actually do anything — it was entirely the improvements in sanitation that happened at the same time. I’d be interested in knowing exactly how Shanghai improved their sanitation by 90% exactly in 1966. And, since the “remarkable” reduction in deaths is amazingly similar to what happened in Finland after the vaccination campaign of 1982, and in Bourkina Fasso after their vaccine campaign of 2002, how coincidentally those countries also introduced new sanitation at exactly the same time as their measles vaccinations. It would be hard to imagine three more diverse conditions than Finland, Bourkina Fasso, and the People’s Republic of China, but measles vaccination worked equally well in all three. This entry is filed under Vaccines. You can follow any responses to this entry through the RSS 2.0 feed. Both comments and pings are currently closed. Unfortunately, reasoning with the loons on the basis of data probably isn’t going to change their minds…that’s why they’re loons, right? What do you think about the argument that some vaccinations may contribute to autism? What do you think about the argument that some vaccinations may contribute to autism? That’s not an argument, it was fraud (see my post here and links therein) and in any case the claim was disproved within a couple years of the original (fraudulant and now retracted) publication; it was the non-science community, preying on the fear and hope of parents of autistic kids, who forced researchers to repeatedly disprove the claim, over and over. In addition to the excellent post here on MMR and autism, Paul Offit’s book is worth a read. If you don’t have time, listen to an interview he did with Ginger Campbell. I reviewed it at virology.ws; see that site for links. I think the most stunning thing about this graph is that it’s on a log-scale. On a log-scale there was a precipitous decline in morbidity! This isn’t some minor tweak — we got nearly 2-logs of decline in measles incidence. I think the last time I saw such an amazing graph was when doing pH titrations in high school chemistry! Once again you choose not to show all the data and manipulate the information presented to people. I ask anyone that reads this nonsense to find statistical graphs showing you measles cases from 1900 through vaccination. When you see the full picture and the full statistics you see the vaccination did nothing. Ignorance is bliss, and this author knows most people will never see all of the data. I ask anyone that reads this nonsense to find statistical graphs showing you measles cases from 1900 through vaccination. I ask the same thing — but I also ask that you CHECK THE REFERENCES. There’s one guy out there who has put up a chart claiming to show a drop in measles before vaccination, but his numbers are completely made up — he offers references that have no relationship to the chart he shows, presumably counting on people being as gullible as this guy here and not checking for themselves. That graph is not only a flat lie, the links he himself gives completely contradict it. See, for example, the link he shows at http://www.whale.to/vaccine/Measles%20Mortality%20in%20the%20United%20States%201971-75%20-%20amended%20graph.pdf (measles mortality doesn’t drop until the vaccine is introduced). See the measles mortality table at http://www.whale.to/vaccine/measles_deaths.html . Compare the (fraudulant) chart at http://www.whale.to/vaccine/All%20Measles%20Deaths%20by%20Population%201901-95%20-%20logarithmic.pdf to the actual numbers at http://www.whale.to/a/measles78.html . Compare to books published in the early 1900s, which contradict his lies. For example, check out the mortality tables in “A treatise on hygiene and public health” (Thomas Stevenson, 1898 — free in Google Books). Or the The Registrar General’s quarterly returns for England and Wales for 1903, also freely available on Google Books. Or read “The bacteriology, pathology, and etiology of measles pneumonia” (Paul Gates Kreider, 1943) (free on Google Books). Or http://www.visionofbritain.org.uk/data_cube_page.jsp%3Bjsessionid=D5475D76827408C91EE6347CCC72940B?data_theme=T_VITAL&data_cube=N_CoD_grouped_U5&u_id=10001043&add=Y . Or http://www.visionofbritain.org.uk/data_cube_page.jsp%3Bjsessionid=2BA9B5E97B16AE6BACD4368A6FB7202F?data_theme=T_VITAL&data_cube=N_CoD_DS_1900s_U5&u_id=10001043&add=Y (note data are pooled over ten years, not annual) . Or the data in The Journal of Hygiene, Vol. 93, No. 3 (Dec., 1984), pp. 587-608 ( http://www.jstor.org/stable/3862793?seq=5). These are the true data — published long before the vaccine — and they bear no relationship to the numbers he’s made up in that chart. He claims that his fraudulant graph comes from the ONS, but see the true ONS data, for example http://www.parliament.uk/commons/lib/research/briefings/snsg-2581.pdf — the numbers are not even remotely similar. He’s simply made it up. He’s not only lying, he’s not even trying to hide his lies. How can anyone take him seriously? How can anyone believe the anti-vaccine propaganda when it’s supported by liars like this?